The GM LS-series is now over twenty years old, but still remains among the most popular engine swaps out there for older, classic vehicles and vintage muscle cars. The aftermarket has provided just about everything and anything needed to make the job easier for the average enthusiast, however, there can still be some setbacks along the way. As with any kind of hot-rodding, some components may have difficulty coexisting with others, but so often is the case, it’s not until the parts arrive that the problem presents itself. This includes issues with the accessory, water pump and throttle body clearances. Understanding the need to solve this problem, our friends at Vintage Air have stepped up to the plate to offer a solution, their low-profile, Front Runner Accessory Drive Kit for LS-Series engines! 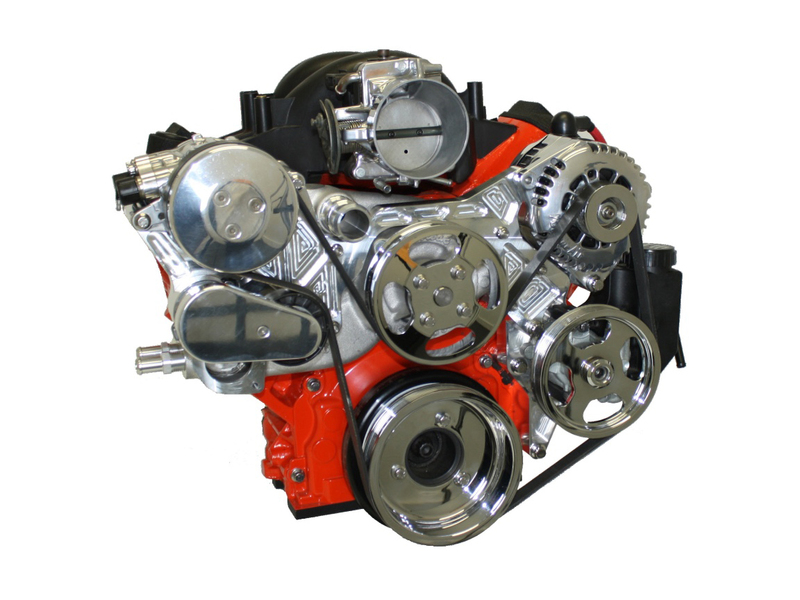 Newly redesigned billet aluminum low-profile Front Runner accessory belt system for the GM LS family of engines provides additional clearance for aftermarket intake manifolds with larger throttle bodies. San Antonio, Texas (July, 2018)– Vintage Air, the leading manufacturer of complete performance air conditioning systems and billet accessory drive systems for classics, hot rods, muscle cars and trucks, has announced the release of its new Low Profile Front Runner system for LS engines with aftermarket or custom intake manifolds that utilize large diameter throttle bodies. The modern Chevrolet small block V8 engine, most commonly known as the LS series, has been a staple within the GM lineup for over two decades. Thanks to the engine’s ease of modification and ability to be stuffed into just about any vehicle ever made, it has become one of the most popular engine platforms among performance enthusiasts. In response to the increasing demand for an LS accessory belt system with “extra clearance” to accommodate aftermarket intake manifolds and large-bore throttle bodies, Vintage Air has designed and introduced its new Low Profile Front Runner system. These new low-profile kits are machined from the same high strength 6061-T6 billet aluminum used on all Vintage Air Front Runner kits. The kit features a redesigned main truss-bracket that provides the additional space required to run an aftermarket intake manifold and larger throttle body. The system also includes a new Edelbrock water pump with replaceable impeller cartridge and threaded heater hose outlets. The system is available in four different finishes – “Bright,” “Bright and Chrome,” “Black” and “Black and Chrome.” The “Bright” finish (Part# 174027) features a machine finished bracket with polished compressor and alternator, chrome pulleys, and polished clutch and tensioner covers. The “Bright and Chrome” finish (Part# 174028) adds a chrome compressor, alternator and clutch and tensioner covers. The “Black” finish option (Part# 174029) features a black anodized bracket with natural finish compressor and alternator, black hardcoat pulleys, and black anodized clutch and tensioner covers while the “Black and Chrome” finish option (Part# 172030) adds chrome compressor and alternator. Vintage Air Front Runner systems are proudly manufactured in the USA, include parts necessary for installation, and are backed by its standard warranty. For more information on the Vintage Air Low Profile LS Chevy Front Runner or any other product, visit www.vintageair.com or call (800) 862-6658. SEMA 2014: SLP Launches 50 YENKO Camaros – Oh, Yeah!